Feigning injury, manager behaviour, offside - what's new? New season; new signings, new kits, new rules. As the English football season gets under way this weekend, players and staff will also have to come to terms with new disciplinary rulings, offside decisions and a brand new ball. The biggest change in discipline sees players who feign injury to get an opponent sent off facing the prospect of being penalised themselves - while managers must adhere to a written code of conduct. In an attempt to clarify the offside rule, new guidance means that players' "attempts to play a ball" or "impacting on an opponent playing the ball" from an offside position will now be flagged. BBC Sport takes a look at the key changes for the 2015-16 season. What is new? A player who feigns injury could face a suspension. What is new? A written code of conduct of what is expected of club staff in the technical area. Manager kicks a bottle of water/waves imaginary yellow card/sarcastic clap. Alternatively, incidents may be classed as "irresponsible" or "unacceptable" in the first instance, which would mean an immediate removal to the stand. 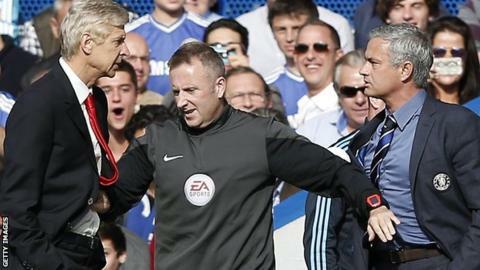 Premier League chief executive Richard Scudamore told BBC Sport: "A bit of the soap opera is good. Clearly, if it oversteps the mark and gets into the unedifying category it needs to be dealt with. "You are going to see a graded approach. It is not going to stop some of the fun and games but hopefully it should stop some of the unedifying moments." What is new? Fewer players allowed to confront referee. Previously, the guideline was three or more players, but that has now been reduced. What is new? The Premier League states: "A player in an offside position shall be penalised if he; 1. Clearly attempts to play a ball which is close to him when this action impacts on an opponent or; 2. Makes an obvious action which clearly impacts on the ability of an opponent to play the ball." West Brom boss Tony Pulis claims that the changes "muddy the waters even more". 2 December 2014: Manchester United 2-1 Stoke. Juan Mata's ball into the box is narrowly missed by Marcos Rojo - in an offside position - but the goal is awarded as he did not touch the ball. The Nike Ordem 3 will be used in the Premier League from this season, starting in the first match between Manchester United and Tottenham Hotspur on Saturday (12:45 BST kick-off). What is new about the ball? It looks like being good news for the goalkeepers. The manufacturers say it "delivers accurate flight, consistent touch and maximum visibility".